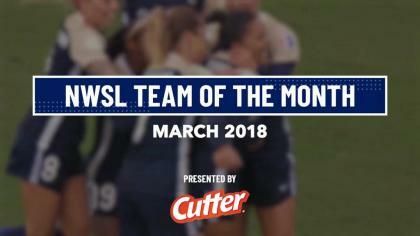 The North Carolina Courage clinched the 2018 NWSL Shield on Sunday night with a 2-1 win over Portland Thorns FC in Week 19 play at Sahlen’s Stadium at WakeMed Soccer Park in Cary, North Carolina. The Courage have now won their second-straight NWSL Shield. Lynn Williams scored a brace for the Courage and claimed the lead in the Golden Boot race with ten goals and four assists on the season. Lindsey Horan scored Portland’s only goal, also for ten goals on the year. The Courage are now 15-1-4 with 49 points and on a seven-game unbeaten streak. The Courage snapped Portland’s three-game winning streak and the Thorns are now 8-6-5 with 29 points. Williams got her team on the board at home in the 37th minute. The last time Williams and the Courage faced the Thorns, the forward also chipped in a brace on the night. Courage midfielder McCall Zerboni won the ball from Thorns forward Christine Sinclair in the box which eventually led to a Courage fast break sparked by Debinha in the middle. Debinha caught Portland in transition and found forward Jess McDonald out wide. McDonald played a service into the box where Williams finished it off for her ninth goal of the year. Not long after Williams scored another one after Courage defender Merritt Mathias served a ball into the box that eventually deflected to the feet of Williams. Williams tapped in her tenth goal of the season in the 45th minute. The Thorns earned one back in the 49th minute when midfielder Tobin Heath curled in a perfectly crafted free kick to the head of midfielder Lindsey Horan. Horan headed home her tenth goal of the season. The Courage dominated with 31 shots to Portland’s nine and also held the better of the possession at 51.6% to 48.4%. Williams finished with a game-high ten shots with four on target. She also made two key passes. McDonald and Courage forward Crystal Dunn each finished with five key passes on the night. Defensively the Courage were strong in Mathias’ five tackles won and two interceptions for six gained possessions. Thorns goalkeeper Adrianna Franch had her work cut out for her, but finished the match with eight saves. Courage goalkeeper Katelyn Rowland made one. The Courage return to NWSL action on Friday vs. the Red Stars and the Thorns will visit the Orlando Pride on Saturday. Match ends, North Carolina Courage 2, Portland Thorns 1. Second Half ends, North Carolina Courage 2, Portland Thorns 1. Offside, North Carolina Courage. Denise O'Sullivan tries a through ball, but Jessica McDonald is caught offside. McCall Zerboni (North Carolina Courage) wins a free kick on the right wing. Foul by Caitlin Foord (Portland Thorns). Corner, North Carolina Courage. Conceded by Emily Sonnett. Attempt blocked. Jessica McDonald (North Carolina Courage) left footed shot from the left side of the box is blocked. Attempt blocked. Crystal Dunn (North Carolina Courage) left footed shot from the centre of the box is blocked. McCall Zerboni (North Carolina Courage) wins a free kick in the defensive half. Substitution, North Carolina Courage. Kristen Hamilton replaces Debinha. Caitlin Foord (Portland Thorns) is shown the yellow card for a bad foul. Abby Dahlkemper (North Carolina Courage) wins a free kick in the defensive half. Attempt missed. Andressinha (Portland Thorns) right footed shot from outside the box misses to the left. Assisted by Celeste Boureille. Attempt missed. Tobin Heath (Portland Thorns) right footed shot from outside the box is close, but misses the top left corner. Assisted by Caitlin Foord. Foul by Jessica McDonald (North Carolina Courage). Elizabeth Ball (Portland Thorns) wins a free kick in the defensive half. Jaelene Hinkle (North Carolina Courage) wins a free kick in the defensive half. Substitution, North Carolina Courage. Crystal Dunn replaces Samantha Mewis. Delay in match (North Carolina Courage). Corner, North Carolina Courage. Conceded by Emily Menges. Attempt blocked. Lindsey Horan (Portland Thorns) header from the centre of the box is blocked. Assisted by Meghan Klingenberg with a cross. Substitution, Portland Thorns. Andressinha replaces Hayley Raso. Attempt saved. Debinha (North Carolina Courage) right footed shot from the centre of the box is saved in the bottom right corner. Assisted by Denise O'Sullivan. Attempt missed. Jessica McDonald (North Carolina Courage) right footed shot from the centre of the box is just a bit too high. Assisted by Debinha. Attempt saved. Caitlin Foord (Portland Thorns) left footed shot from the centre of the box is saved in the top centre of the goal. Assisted by Christine Sinclair. Attempt saved. Abby Erceg (North Carolina Courage) right footed shot from the centre of the box is saved in the centre of the goal. Assisted by Debinha with a cross. Substitution, Portland Thorns. Elizabeth Ball replaces Midge Purce. Corner, North Carolina Courage. Conceded by Midge Purce. Attempt blocked. Denise O'Sullivan (North Carolina Courage) right footed shot from the centre of the box is blocked. Attempt missed. Lynn Williams (North Carolina Courage) right footed shot from the centre of the box is just a bit too high. Attempt saved. Samantha Mewis (North Carolina Courage) right footed shot from outside the box is saved in the bottom left corner. Delay in match Tobin Heath (Portland Thorns) because of an injury. Corner, Portland Thorns. Conceded by Abby Dahlkemper. Meghan Klingenberg (Portland Thorns) wins a free kick in the defensive half. Attempt missed. Jessica McDonald (North Carolina Courage) right footed shot from outside the box misses to the right. Assisted by Debinha. Attempt missed. Samantha Mewis (North Carolina Courage) right footed shot from the centre of the box misses to the left. Assisted by Lynn Williams. Substitution, Portland Thorns. Caitlin Foord replaces Ana Maria Crnogorcevic. Attempt missed. Lynn Williams (North Carolina Courage) right footed shot from outside the box misses to the right. Offside, North Carolina Courage. Samantha Mewis tries a through ball, but Debinha is caught offside. Hand ball by Debinha (North Carolina Courage). Attempt saved. Lynn Williams (North Carolina Courage) right footed shot from the centre of the box is saved in the centre of the goal. Assisted by Abby Erceg. Denise O'Sullivan (North Carolina Courage) wins a free kick in the defensive half. Foul by Tobin Heath (Portland Thorns). Foul by McCall Zerboni (North Carolina Courage). Christine Sinclair (Portland Thorns) wins a free kick in the defensive half. Attempt missed. Lynn Williams (North Carolina Courage) left footed shot from the centre of the box misses to the left. Assisted by Samantha Mewis with a cross. Goal! North Carolina Courage 2, Portland Thorns 1. Lindsey Horan (Portland Thorns) header from the centre of the box to the bottom right corner. Assisted by Tobin Heath with a cross following a set piece situation. Foul by Abby Erceg (North Carolina Courage). Hayley Raso (Portland Thorns) wins a free kick on the right wing. Offside, North Carolina Courage. Jaelene Hinkle tries a through ball, but Jessica McDonald is caught offside. Attempt missed. Lindsey Horan (Portland Thorns) right footed shot from outside the box misses to the right. Assisted by Hayley Raso. Second Half begins North Carolina Courage 2, Portland Thorns 0. First Half ends, North Carolina Courage 2, Portland Thorns 0. Attempt blocked. Jessica McDonald (North Carolina Courage) right footed shot from the right side of the box is blocked. Assisted by Samantha Mewis. Delay in match Debinha (North Carolina Courage) because of an injury. Emily Sonnett (Portland Thorns) is shown the yellow card for a bad foul. Debinha (North Carolina Courage) wins a free kick in the defensive half. Foul by Emily Sonnett (Portland Thorns). Hand ball by Denise O'Sullivan (North Carolina Courage). Attempt saved. Samantha Mewis (North Carolina Courage) left footed shot from outside the box is saved in the centre of the goal. Samantha Mewis (North Carolina Courage) wins a free kick in the defensive half. Foul by Lindsey Horan (Portland Thorns). Goal! North Carolina Courage 2, Portland Thorns 0. Lynn Williams (North Carolina Courage) left footed shot from the centre of the box to the bottom right corner. Attempt blocked. Denise O'Sullivan (North Carolina Courage) right footed shot from the centre of the box is blocked. Assisted by Jessica McDonald. Attempt blocked. Lynn Williams (North Carolina Courage) right footed shot from outside the box is blocked. Assisted by Denise O'Sullivan. Attempt saved. McCall Zerboni (North Carolina Courage) header from the centre of the box is saved in the centre of the goal. Assisted by Jessica McDonald. Attempt blocked. Jessica McDonald (North Carolina Courage) header from the centre of the box is blocked. Assisted by Abby Dahlkemper with a cross. Attempt missed. Jessica McDonald (North Carolina Courage) right footed shot from outside the box misses to the right. Assisted by McCall Zerboni. Goal! North Carolina Courage 1, Portland Thorns 0. Lynn Williams (North Carolina Courage) left footed shot from the centre of the box to the bottom left corner. Assisted by Jessica McDonald with a cross. Attempt missed. Celeste Boureille (Portland Thorns) right footed shot from outside the box is high and wide to the right. Assisted by Hayley Raso. Attempt missed. Jessica McDonald (North Carolina Courage) header from the centre of the box is too high. Assisted by Denise O'Sullivan. Foul by Samantha Mewis (North Carolina Courage). Lindsey Horan (Portland Thorns) wins a free kick in the defensive half. Attempt blocked. Denise O'Sullivan (North Carolina Courage) right footed shot from outside the box is blocked. Assisted by Jessica McDonald. Attempt missed. Jessica McDonald (North Carolina Courage) right footed shot from the right side of the box is close, but misses the top right corner. Assisted by Debinha. Debinha (North Carolina Courage) wins a free kick on the left wing. Foul by Midge Purce (Portland Thorns). Attempt missed. Lynn Williams (North Carolina Courage) left footed shot from the left side of the six yard box is close, but misses to the left. Assisted by Jessica McDonald with a cross. Delay in match McCall Zerboni (North Carolina Courage) because of an injury. Foul by Debinha (North Carolina Courage). Emily Sonnett (Portland Thorns) wins a free kick in the defensive half. Foul by Christine Sinclair (Portland Thorns). Attempt missed. Lynn Williams (North Carolina Courage) header from the centre of the box misses to the left. Assisted by Merritt Mathias. Attempt missed. Debinha (North Carolina Courage) right footed shot from outside the box is close, but misses to the left. Assisted by Lynn Williams. Attempt saved. Lynn Williams (North Carolina Courage) left footed shot from a difficult angle and long range on the right is saved in the centre of the goal. Assisted by Denise O'Sullivan. Attempt missed. Merritt Mathias (North Carolina Courage) right footed shot from outside the box misses to the left. Corner, North Carolina Courage. Conceded by Meghan Klingenberg. Attempt missed. Abby Erceg (North Carolina Courage) header from the centre of the box misses to the right. Assisted by Merritt Mathias with a cross. Attempt missed. Christine Sinclair (Portland Thorns) left footed shot from the centre of the box is too high. Assisted by Lindsey Horan. Offside, Portland Thorns. Meghan Klingenberg tries a through ball, but Christine Sinclair is caught offside.